Spring is in the air! We are moving towards longer and lighter days and the world around us starts to turn back into the green oasis that we’ve been longing for all winter. 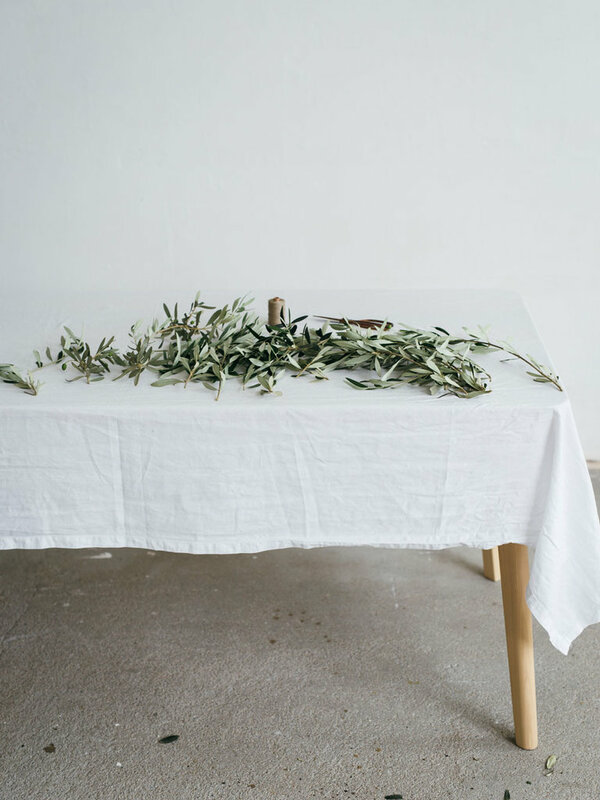 The change of seasons and the reviving green surroundings was a starting point of the planning of this Minimalistic wreath making workshop hosted by Jennifer Laarman X Blomsterkrans. Learn how to create your own wreath with natural colours and fresh, playful greens that is to be enjoyed for a long time. 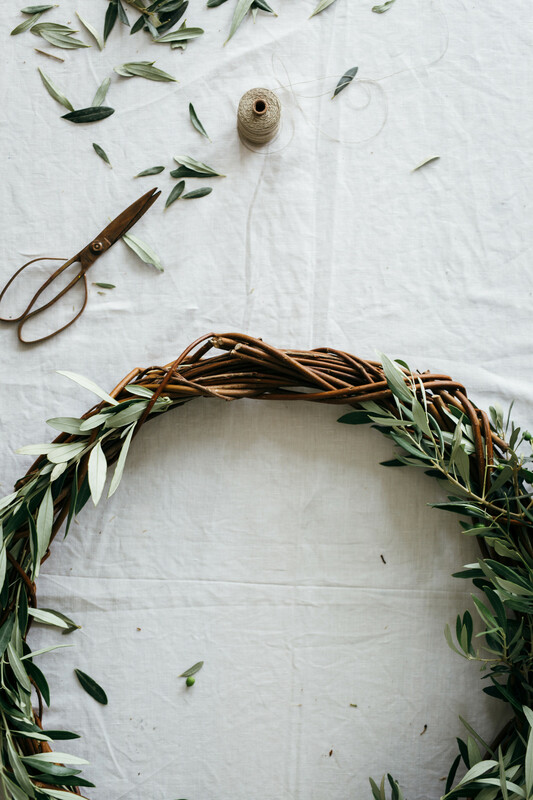 In this workshop you learn how to style a typical Blomsterkrans minimalistic willow wreath. 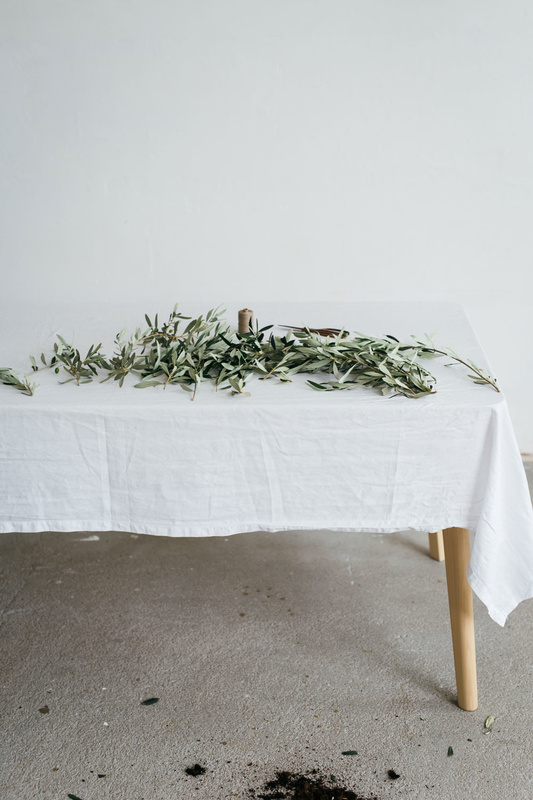 We will use beautiful olive branches and lovely smelling eucalyptus. 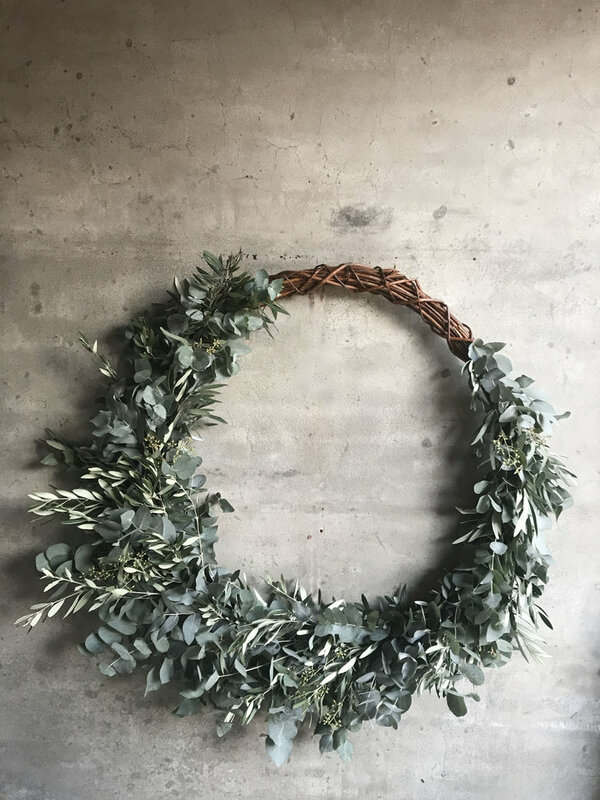 In the process of this wreath making we believe in emphasizing the beauty of simple materials, which is an important lesson that originates from the Japanese Wabi Sabi culture. The workshop will be held in the new and stylish studio of LOFT in Arnhem, which is the home base of beautiful rooms filled with natural light and authentic details. Flowerstylist Jennifer Laarman offers contemporary flower concepts with her creative styling studio. Her offerings vary between custom made flower workshops and flower styling for events. She is fully self taught out of pure passion and enthusiasm for flowers. She gets most of her inspiration from nature itself and the latest trends. This results in a combination of graceful and sturdy pierces with fresh flowers and lots of natural materials. 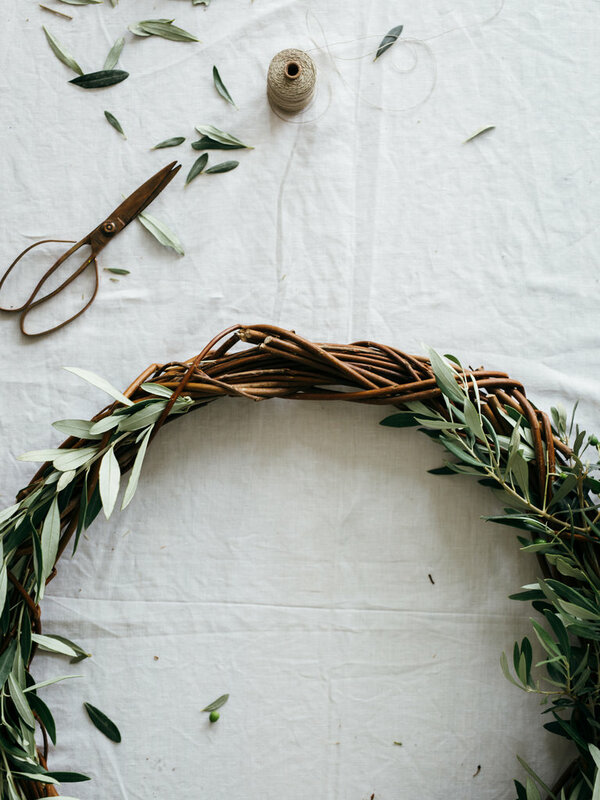 At Blomsterkrans you will find flower wreaths that are a little different from traditional wreaths; they are playful, natural and particularly stylish. Blomsterkrans was founded by Chantana and Bineke, a creative studio that runs an online store with flower wreaths. Together they work on various projects where design and craftsmanship is essential. Blomsterkrans and Jennifer match perfectly; contemporary, playful and self-taught in the flower business. We have combined forces to offer a unique, creative and above all a fun and informative workshop. You will get a look inside the working methods of these three ladies, how to handle flowers, what the value is of flowers and how you can bring together the seasons in a wreath. With this wreath you bring a pierce of outside into your home. Surrounded by the lovely smell of seasonal greens and willow wreaths, Jennifer will show how to layout your own spring wreath. She will talk about different types of greens and various cutting- and arranging techniques. We will also explain the background story of the wreaths. You will learn about the process of during flowers and greens and arranging in the style of Blomsterkrans. The starting point of the workshop is the use of natural materials, in the use of the green material and in the styling of the wreath. Blomsterkrans and Jennifer Laarman will share their knowledge and experience on making a spring wreath with lovely greens. We will use a artisanal braided willow wreath that can be used for years to come after the workshop. You can take the Blomsterkrans wreath home and give it a nice place in your house. Cost: The costs for this workshop are€ 75,00 per person for a 30 cm wreath with a surcharge of €15,00 when you choose to make a 50 cm wreath (prices are inclusiding 9% VAT). The price includes coffee, tea and snacks. Also the use of available tooling and green material to be used in the making of the wreath are included. After the workshop you can take home the Blomsterkrans wreath to enjoy it for years. For who: There is much to learn in this workshop and it is therefore open for everyone. Both beginners and experienced are welcome. We will host the workshop in English but since we’re all native Dutchies we can explain in both languages. There is a limited amount of places for each workshop, so make sure to snap your ticket via the webshop.